After his second title in Shanghai, the 36-year-old said that he has shaken off the "scars" of his many defeats to Nadal. Image Source : GETTY IMAGES Roger Federer and Rafael Nadal pose with their trophies during the Shanghai Masters. 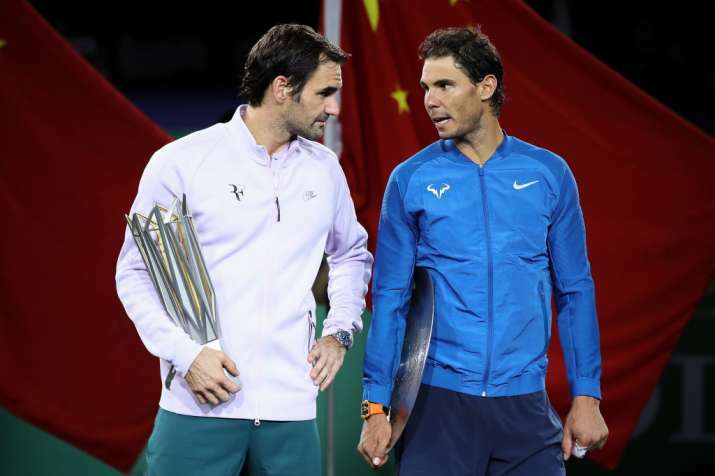 Roger Federer has heaped praise on Rafael Nadal, saying the current world number one is "too good a player" and it won't be possible for the Swiss to win all the matches against him in the near future. These comments come after Federer defeated Nadal 6-4, 6-3 to win the men's singles title of the Shanghai Masters on Sunday. However, Federer still trails the Spaniard 15 to 23 in their 38 encounters so far. Despite closing the gap with Nadal both on the numero one spot in the ATP Rankings and in their FedEx ATP Head2Head series this season, Federer insists that they aren't targets for him - especially in the latter metric, where the Spaniard still leads by eight wins. "It's not going to happen," said Federer as saying bluntly on overtaking Nadal in their rivalry. "We don't have enough years left on the tour, and we're ranked too good that we play each other only in finals at the moment. It looks like that's going to stay like this for a few months more. So can't win them all against Rafa, to be honest. He's too good of a player," he added. After his second title in Shanghai, the 36-year-old also said that he has shaken off the "scars" of his many defeats to Nadal after claiming his second title in Shanghai with his fifth win in a row over the current world number one. Federer had earlier defeated Nadal in the finals of the Australian Open and Miami Masters and in the last 16 at Indian Wells. "I just think I'm not so scarred like maybe I have been in the past, not that I was horribly scarred in any way, but I did lose against him sometimes, a lot of the times especially on the clay courts.But, yeah, I think I have also played him well. Clearly avoiding him - not playing him on clay has helped," said Federer. "So I'm able to stay on the hard courts or on faster courts against him, but I have been playing very well when I have faced off against him," he added.